No other Filipino athlete has attained or even came close to reaching the status and influence that Manny Pacquiao has built for himself during his boxing career which as of this writing has run for nearly nineteen years. Pacquiao's career as a professional boxer is still running and this coming May 2 at the historic MGM Grand, he will once again step into the squared ring to face his most dangerous opponent to date, the extremely talented and yet to be defeated Floyd Mayweather Jr. In most of his 64 previous fights, Pacquaio had been a favorite to win. In his upcoming encounter with Mayweather, Pacquiao is an underdog. More people subscribe to the idea that Mayweather's defense and ring-savvy will lead him to an easy victory. This is not the first time that Pacquiao is installed as an underdog going into a fight. In some of his previous bouts, he was an underdog but he proceeded to dispose of his opponents quite easily. But then again, these opponents were not Floyd Mayweather Jr. You could say that their skills combined can't even equal those of Mayweather. In the instance that Mayweather will defeat Pacquiao, he won't be the first to do so. Pacquiao have been defeated five times by five different boxers. Three of these five losses were via brutal knockouts. Let's take a look into these five men and what happened to them after defeating the great Manny Pacquiao. Rustico Torrecampo will always be known as the first man to ever defeat Pacquiao. And he did it in a brutal fashion by crumpling Pacquiao in the third round with a straight punch to the face. Pacquiao just turned pro the year before and has notched 11 straight wins. With his confidence high, he got into the ring with Torrecampo and immediately engaged him in a slugfest. It was a wild fight. Torrecampo and Pacquiao were throwing wild punches and not thinking even for a little about defense. In the exchanges, Pacquiao was landing more meaningful shots. 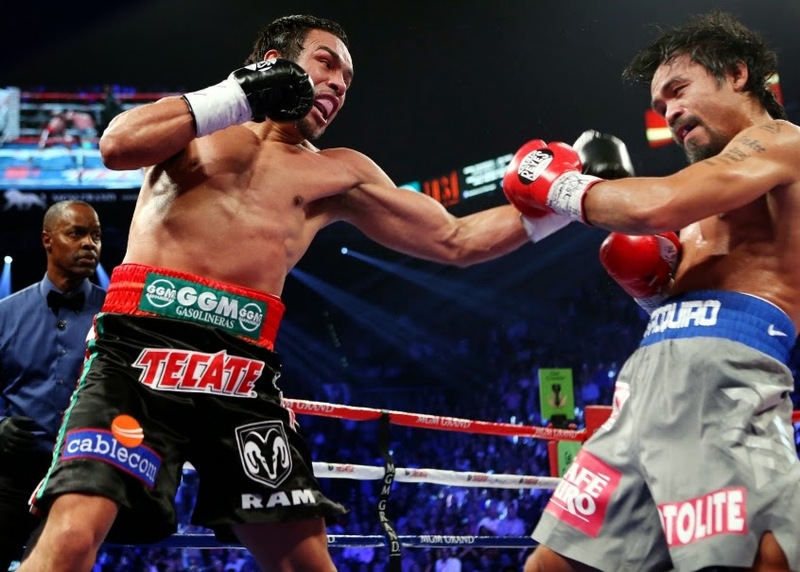 The end came in the third round when Torrecampo caught Pacquiao flush in the jaw as the latter lunged in to attack. The win over Pacquiao was a meaningful victory but Torrecampo's career sort of tanked after it. He lost most of his fights then retired in 1997. He made a successful comeback in 2011 by knocking out Jovanie Bualan. He stopped fighting after that. Rumors has it that Torrecampo is now running a mamihan business. After the loss to Torrecampo, Pacquiao got back on the right track and blazed his way through 15 opponents. He knocked out most of them and in the process winning several belts including the OPBF flyweight belt and the WBC flyweight belt. For his second defense of his WBC flyweight title, Pacquiao flew all the way to Thailand to fight his challenger - an undefeated and heavy-punching Thai named Medgoen Singsurat. It turned out to be a disaster as Pacquiao got flattened by a body shot in the third round. It was an uneventful fight as Pacquiao, looking frail and weak, backtracked most of the fight. Then the body shot landed and it was all over. Pacquiao's team said that their fighter wasn't 100% during the fight as he struggled to make weight. He lost his WBC belt at the scales because he went over the 112 pounds weight limit. Singsurat's career after the Pacquiao victory was a very colorful one. He went on to win several world championship belts in his weight division. He retired in 2011 leaving a fight record of 74 wins and only 6 losses. 51 of his victories came by knockouts. 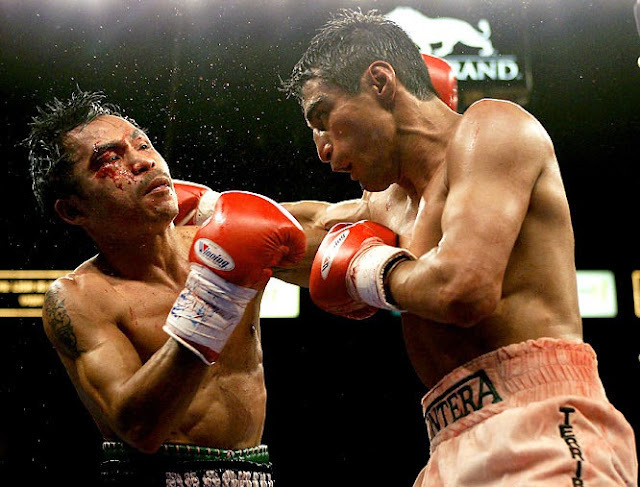 When Erik Morales and Pacquiao met in 2005 in front of a raucous crowd at the MGM Grand, Morales has slid a bit from his peak while Pacquiao was starting to get there. Both fighters have two losses in their records but Morales has lost to a single man - Marco Antonio Barrera. Pacquiao was a slight favorite to win the fight but when fight night came and ended, it was the underdog who had his hands raised. Morales boxed his way towards a unanimous decision victory. It was a very clear win. Morales schooled Pacquiao, period. Morales and Pacquiao went on to fight each other two more times to complete a memorable trilogy. The outcomes were very different from the first. In the second and third fights, Pacquiao handily won via knockouts. After the back-to-back losses to Pacquiao, it was downhill from there for Morales. He won a few fights but lost to higher-level fighters like David Diaz and Marcos Rene Maidana. He finally retired in 2012 after losing twice to Danny Garcia who currently reigns as the king of the light welterweight division. After redeeming his loss to Erik Morales, Pacquiao went on to break world records by easily moving from division to division knocking out high-level boxers in the process. He beat the likes of Oscar dela Hoya, Ricky Hatton, David Diaz, Miguel Cotto, Joshua Clottey, Antonio Margarito and Shane Mosley. When the undefeated Timothy Bradley signed on to fight Pacquiao in 2012, not many people gave him the chance to win. Yes, he was undefeated. Yes, he has beat great fighters like Devon Alexander, Junior Witter, Lamont Peterson, and Kendall Holt. However, most people believed he didn't have the quickness and punching power of Pacquiao. When fight night came, it was more competitive than what most people expected. 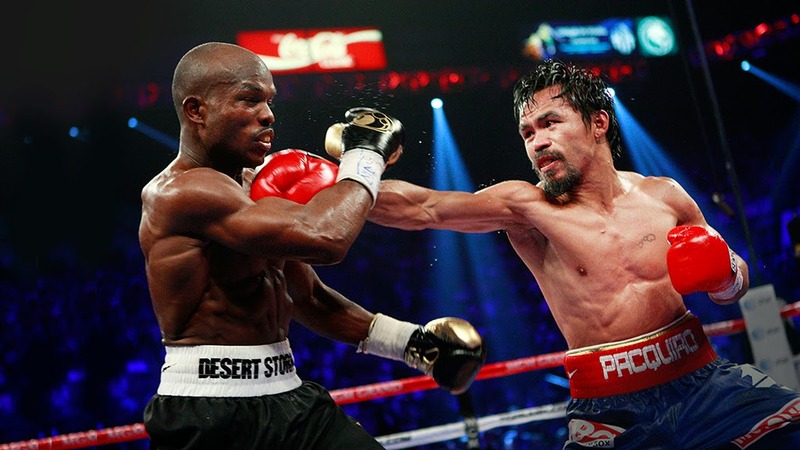 Bradley and Pacquiao engaged in a technical battle for the whole twelve rounds. 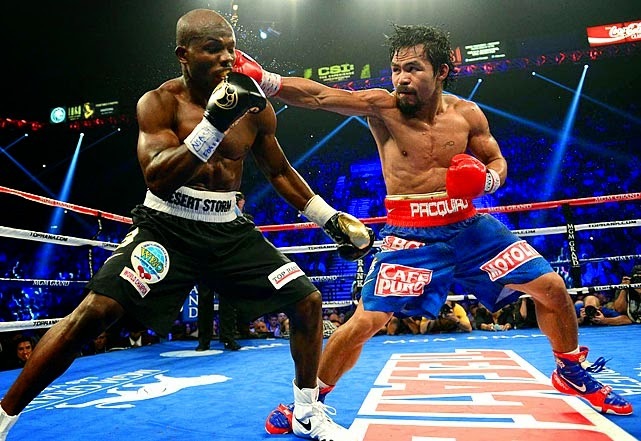 Although most observers thought Pacquiao won, Bradley was awarded the victory via a split decision verdict. Bradley may have gotten a gift decision during the first Pacquiao fight but he proved that he was a true champion by winning his next fights against Ruslan Provodnikov and Juan Manuel Marquez. The irony here is that Bradley handily defeated Marquez, a fighter whom Pacquiao never decisively defeated. As everyone knows, Bradley and Pacquiao fought in a rematch which Pacquiao won this time via unanimous decision. Photo by Chris Farina of Top Rank. Juan Manuel Marquez will always be remembered as the Mexican warrior who fought Pacquiao four times. Maybe five times if the two decide to fight again. When they first fought in 2004, Marquez survived three knockdowns in the first round in a fight that ended up as a draw. In their second and third fights, Pacquiao was given decision victories but there are a lot of people contesting said decisions including Marquez himself. The first three fights were all very close. The victories could've gone to either fighter. When Marquez and Pacquiao fought for the fourth time in 2012, the outcome was clear and no controversy was needed. Marquez knocked Pacquiao cold. It was a very competitive fight and for six rounds, the two fighters battled like they always do. Marquez took control of the early rounds and even scored a flash knockdown. However, Pacquiao got more aggressive and turned the fight to his favor. He bloodied Marquez, broke his nose, and got him wobbling in the ring. But it was the same aggressiveness that caused his downfall. Marquez timed a perfect counter punch which landed flush on the jaw of the rushing Pacquiao. Kenny Bayless waved off the fight when he realized that Pacquiao was unconscious and unfit to continue. Will Mayweather be the sixth man to defeat Pacquiao? We will find out when the two finally meet in the ring come May 2. There are five Manny Pacquiao losses and if there's anyone who can increase that number, that would be Floyd Mayweather Jr.